Per my normal, I bought a bag full of zucchini without any specific plans for them. 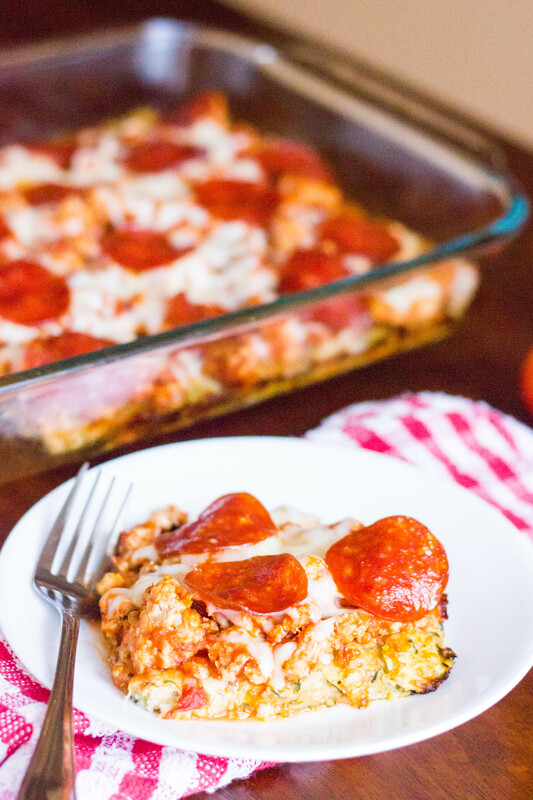 I love zoodles, but when this recipe for Zucchini Pizza Casserole popped up in my inbox I knew what I was making with my zucchini! =) I altered the recipe slightly to make it healthier and a little more pizza-like (hello pepperoni!). I used extra lean ground turkey, less sauce, and less cheese (but it’s still plenty cheesy don’t worry! ), so I felt like it was totally fine to add some pepperoni. I used regular but feel free to use turkey pepperoni instead. 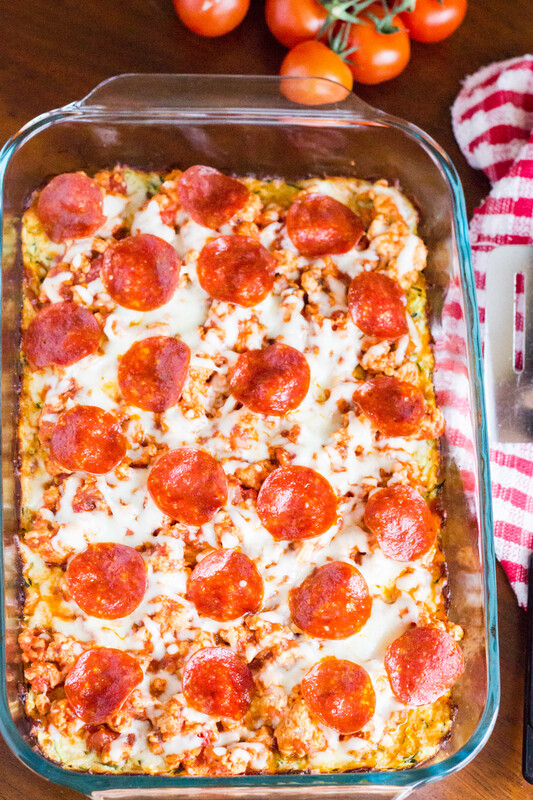 Even with the pepperoni, each serving is just over 200 calories and has 26 grams of protein! 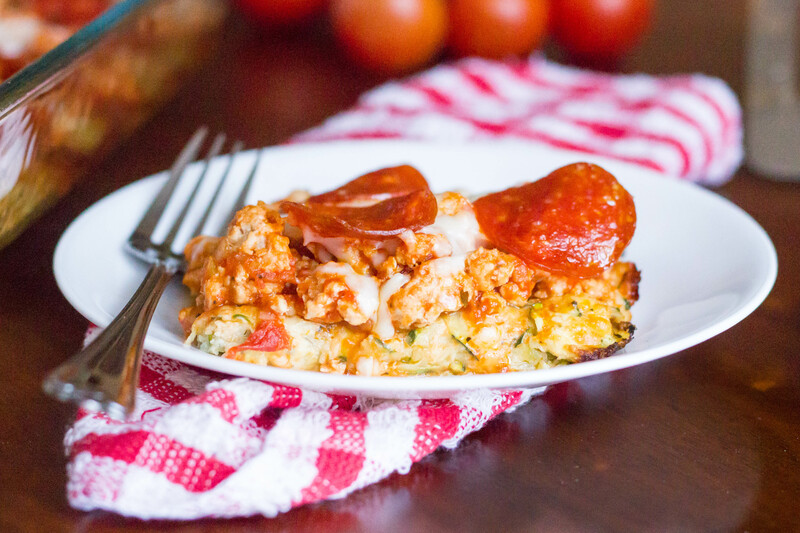 It’s a pizza dinner you can feel good about eating – healthy AND delicious! Enjoy! 1. Place zucchini in strainer; sprinkle with salt. Let stand for 10 minutes. Squeeze out moisture. 2. Combine zucchini with the egg whites, parmesan, garlic powder, italian seasoning, and half of the mozzarella. Press into a greased 13×9-in baking dish. 3. Bake, uncovered, at 400° for 20 minutes. Meanwhile, cook turkey and dried minced onion over medium heat until meat is no longer pink; drain. Add marinara; spoon over zucchini mixture. 4. Sprinkle with remaining cheese; top with pepperoni. Bake 15- 20 minutes longer. Nutritional Info (per 1/8th): 211 calories; 9.1 g fat; 6.4 g carbohydrates; 26.4 g protein. Your recipe calls for 20 pepperonis, but your picture clearly shows 21. Which is it???? Just made this and it is delicious!! It even taste great the next day warmed up. Will be making this again! Is that 91 grams of fat? How do you “shred” your zucchini? Recipe says “place zucchini in strainer…” – is this raw, shredded zucchini or did you steamit first? Apologies if this has already been asked – I cannot view any of the other comments listed. I shred my zucchini on a box grater. Then, I strain the raw zucchini. Hope this helps! Thanks for stopping by! Glad you enjoyed! Thanks for stopping by! Does this freeze well or keep for a few days if I plan on eating it for a few dinners throughout the week? I haven’t tried freezing it but it keeps for a couple days in the fridge – not quite as good as day one though but still tasty! Thanks for stopping by! Hope you enjoy :). Would this work just as well with fresh onion? I think you could easily use some finely chopped fresh onion. Hope you enjoy! Are the carbs net carbs or total carbs? If not net do you know the net carbs? It’s total carbs. It has one gram fiber per serving so I think net carbs would be 5.4 grams. Hope that helps! My local grocery store was out of zucchini, so I took a chance and made it with yellow squash instead. Probably tastes different from the original (I wouldn’t know at this point), but my family and I had no complaints about it all! Made this last night and just omitted the pepperoni (to start – will try it next time!) It was easy and delicious! I will definitely make this again, and my 2.5 year old loved it too!